When keeping it "REAL" goes Wrong! 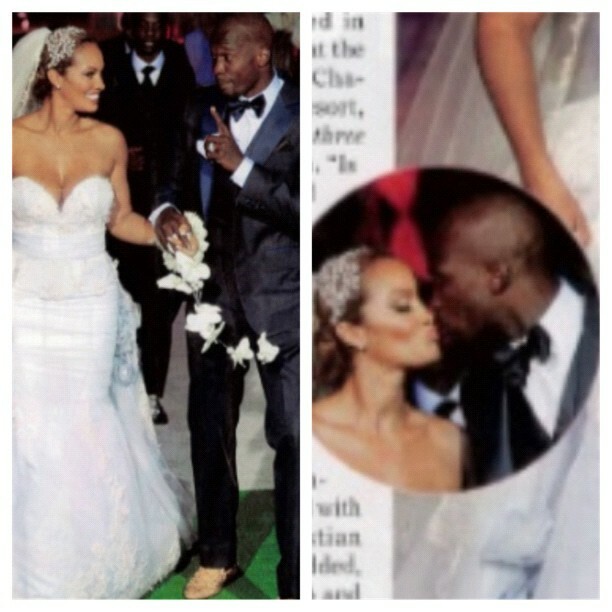 Evelyn Lozada married Chad Johnson on July 4, 2012. Congrats to Evelyn Lozada -Johnson and Chad Johnson for beating Kim Kardashian and Chris Humphries, and their "reality" record for shortest marriage. Today, Lozada filed for divorce from Chad Johnson after a whooping 41 days of marriage (Kim K filed for divorce just 72 days after marriage). Today Lozada announced she was the victim of domestic abuse, by the hands of her husband Chad Johnson. Allegedly, this past Saturday, Johnson head-butted Lozada during an argument. Lozada then ran to her neighbors' to call the police. Johnson was arrested and held in jail overnight. In discussing the matter with my co-worker, I began to belt out the lyrics to Frank Ocean's "American Wedding" before I realized what I was doing. The lyrics "Its just an American Wedding, they don't mean too much, they don't last enough..." unfortunately reign true if you were to base your opinion of love and marriage on "reality tv". 41 days ... 72 days .... clearly does not add up to a LIFETIME or a FOREVER. As a result of the incident (of which we have yet to really hear Chad's side), Chad Johnson has been released from his football contract with he Dolphins, and VH1 has decided to drop Chad and Evelyn's upcoming "reality" series. As you can see, no one wants to be associated with domestic violence. It is a serious matter. It seems like all the signs to NOT get married may have been there for Evelyn (rumours of infidelity, constant suspicion, broken relationship with her best friend, etc.) But, for her, she was in love. To her, him, them ... this was REAL. Its unfortunate the things that may happen, when keeping it REAL goes wrong. You can only pretend for so long, right? What do you think? Do you think their union was ever really REAL/GENUINE?? Do you think "REALity tv" took over their chances for a genuine love? Or, you can't help who you love?? Sometimes we do stupid things in the name of love, right? Or do we claim "LOVE" so we can do STUPID things?